Case of 12 x 32 oz Flint (Clear) EZ Cap Bottles and 12 Swing Tops. Crown Caps not included (see recommended items below for options). Very easy to use and reuse. Pour some and put the rest in the fridge! We are a commercial company and used these bottles for a little over a year, we bottle roughly 2100 bottles a month. I would not recommend these bottles to anyone. We bottled up a batch and once we were finished we realized that about 75% of the bottles were leaking. I immediately contacted EZ-cap who said that they would only replace the bottles, but had no concern for the loss of our product. We make mead, its not cheap. 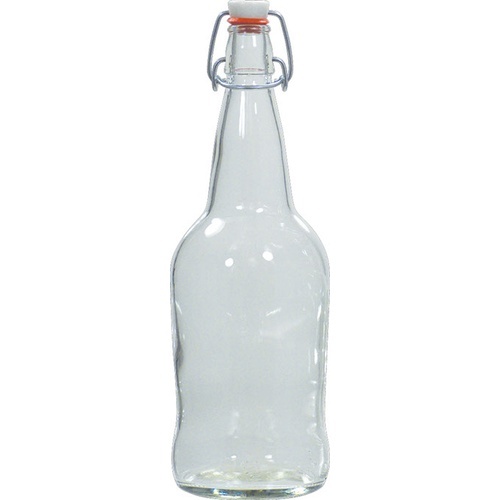 We have decided to discontinue our use of these bottles because the company does not stand behind their product. The bottles leaked due to a malfunction in the cap making system where the mold was overfilled (the company admitted this). This caused a small ridge to develop vertically along the cap, not allowing the gasket to seal properly. This is where our mead was leaking from. A bottle really only has one purpose, to seal properly. Bottles that don’t seal properly might as well be cups. We stand behind our product, and we wont deal with a company that doesn’t stand behind their product. I would highly recommend finding a different company to get your glass. Their lack of contact with us and poor customer service have also led to this review. only 1 month from purchase, but so far they are holding a great seal as I use these to secondary ferment kombucha. These bottles are awesome and best price avail. I am ordering my 3rd set, seal tight, sanitize well, and very sturdy. Super happy. I am placing my second order for these bottles. I brew Kombucha at home, which can be very explosive in the wrong type of bottles. This product seals TIGHT and has never exploded with carbonation pressure. This is a good, high quality bottle and the price is right. I brew Kombucha and pull three of these bottles every couple days so these bottles are awesome. For the price you get 12 which is also very affordable. They're fairly easy to clean and seal very tightly. Kombucha can hold a lot of carbonation at times and I've had no problems with bottles bursting so they're strong and seal tightly. A good buy for sure.